Plutchik's emotion wheel. A model of human emotions for machines. 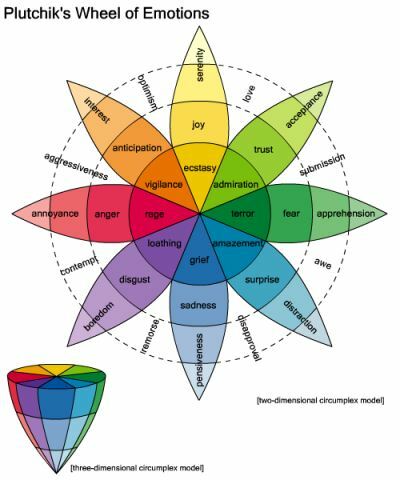 The wheel of emotion was invented by Robert Plutchik to defines a model of human emotions and their relations and combinations. It consists of 8 basic emotions, opposed in pairs, and multiple shades. Admiration - trust - acceptance. Terror - fear - apprehension. Amazement - surprise - distraction. Grief - sadness - pensiveness. Loathing - disgust - boredom. Rage - Anger - annoyance. Vigilance - anticipation - interest. Ecstasy - Joy - serenity. To give heart to robots and make them more human, the model should be completed.